“Enka” singer from Aomori prefecture. 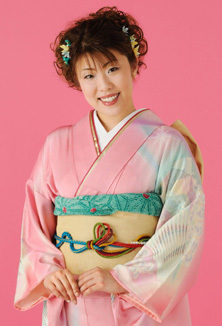 Her skills are “Tsugaru Jyamisen” and “enka dancing”. She amazed her mother by perfectly memorizing a classic song of the Showa, “Ganpeki no Haha” at the age of 3. Won numerous karaoke competitions all over the country from a very young age and debuted from Nippon Columbia with the song “Jongara Otoko Bushi” in 1993.